Are you able to download already existing AVI onto Kindle Fire HD to watch them? Home » Are you able to download already existing AVI onto Kindle Fire HD to watch them? Anything you have not in one of these formats will need to be converted. With the new Kindle Fire HD are you able to download already existing AVI onto the device to watch them? The answer is “NO”. As neither Amazon nor its subsidiaries provide any content in .avi format that may be the reason it's not supported. If that is the case, Kindle Fire HD owners need to render AVI movies to MP4 for smooth playback on their Amazon tablets. MP4 is quite good, and you will find a lot of HD movies display beautifully in this format. It is beyond simple to download Pavtube Video Converter to quickly and easily convert AVI to MP4 for your Kindle Fire HD device. Here comes a step-by-step instruction. Pavtube Video Converter (here in this article we simply run it as an AVI to MP4 converter for Kindle Fire HD). How to render AVI movies to MP4 for Kindle Fire HD? Launch Pavtube Video Converter as the best HD AVI to Kindle Fire HD Converter, and click “Add video” or “Add from folder” button to load your source files in .avi format. 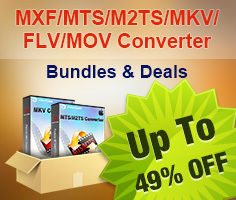 As a versatile HD video to Kindle Fire HD Converter, you can also import 1080p MKV files and other HD media into Pavtube software to do format conversion. 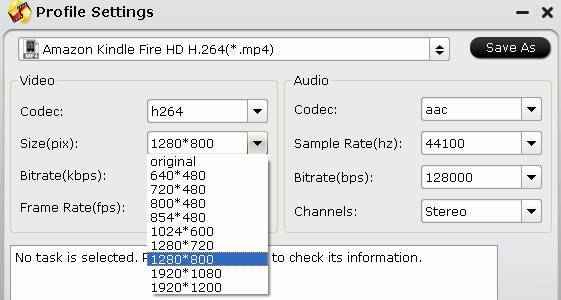 If you can not find the “Amazon Kindle Fire HD H.264 (*.mp4)” profile in the current version of Pavtube Video Converter you are using, you can download a profile patch here. If you prefer to create 1080p videos for Kindle Fire HD 8.9”, you can reset video resolution to 1920*1080 to get 1080p quality; if you would like togenerate 720p videos for Kindle Fire HD 7’, you can reset video resolution to 1280*720 to acquire 720p quality. Click “Convert” button to start rendering AVI video to Kindle Fire HD preferred MP4 video. If you don’t’ want to wait around for the entire conversion process, you can tick off the checkbox before “Shut down computer after conversion”. When conversion completes you can click “Open” button to get the generated files and transfer these MP4 videos to Your Kindle Fire HD via USB connection.